Now in its ninth enchanting year, the Martha’s Vineyard Teddy Bear Suite Fundraiser is a magical holiday tradition where family memories are made, and the money raised goes to help the Martha’s Vineyard Boys And Girls Club, and its vital After School Programs, in particular, the food services that are used by one out of every three elementary school-aged children and their families every week. Over its eight years, the Martha’s Vineyard Teddy Bear Suite has raised $171,000 that directly supported a number of after school programs and services at the Boys & Girls Club, including mentoring services, and programs in the arts, activities, homework, and a variety of facility upgrades. In year six, the 2016 drive raised $35,000. 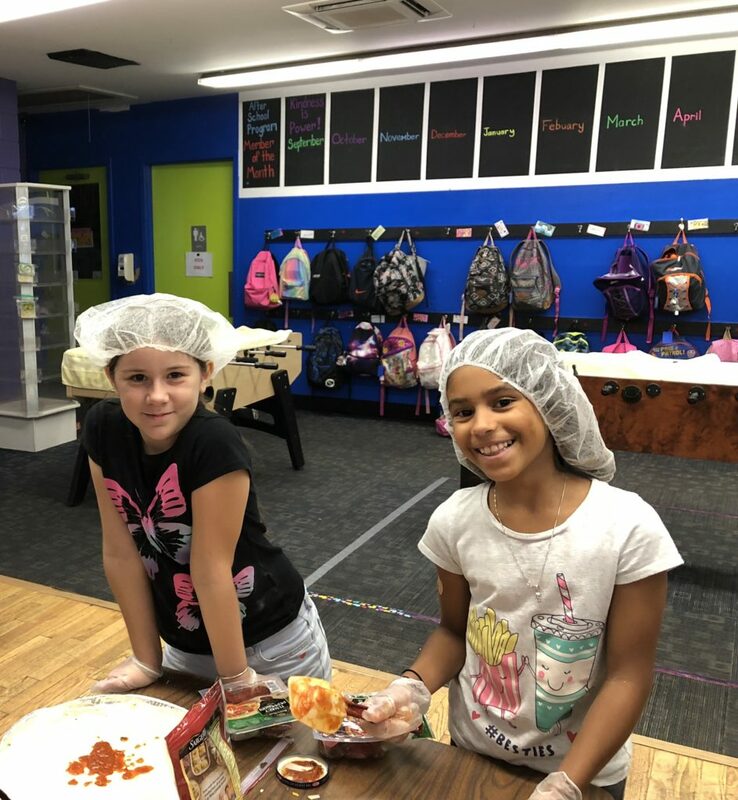 That was enough to fund the entire cost of launching and supporting the Club’s new Healthy Happy Kids initiative, which targets childhood hunger and food insecurity on the island, which sadly, is more prevalent than many have realized. Since then, the H2K program has expanded to now serve healthy snacks and meals to almost one out of every three elementary school-aged children on the island. 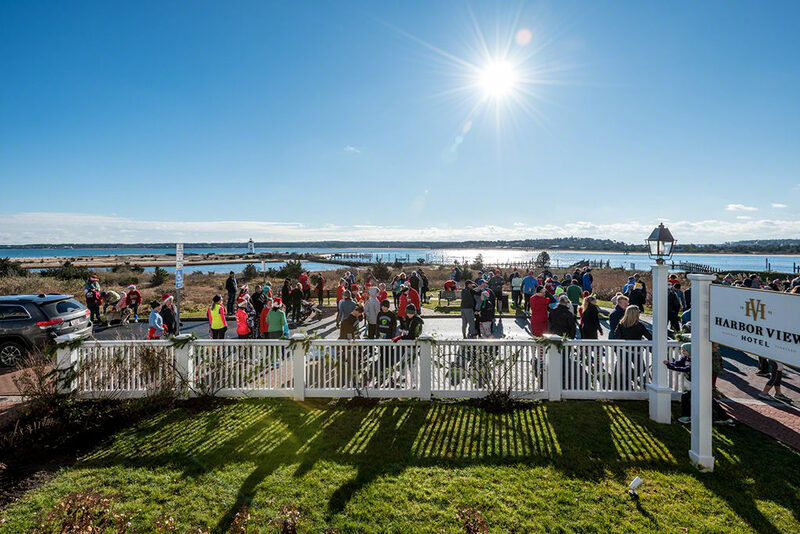 Founded and sponsored by Point B Realty, the annual holiday fundraiser opens its doors each December to coincide with the Christmas in Edgartown weekend. 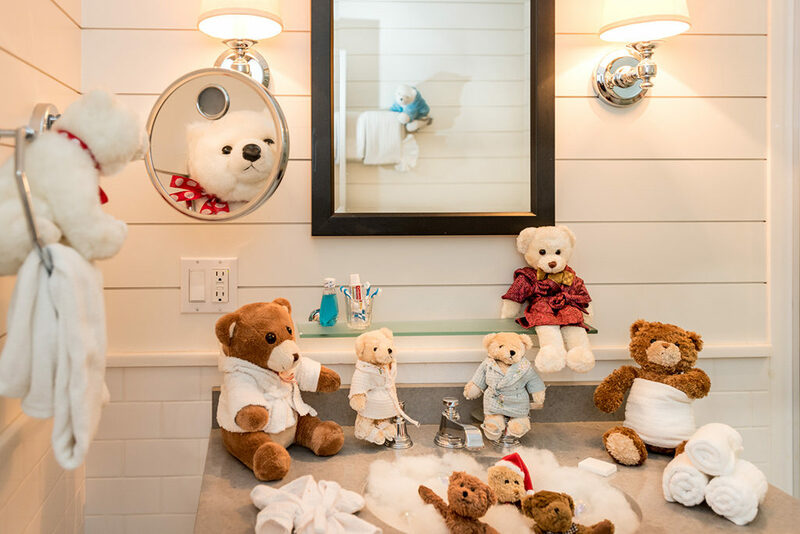 The Martha’s Vineyard Teddy Bear Suite was initially hosted at the Harbor View Hotel, but moved in-town in 2018 to Nevin Square. The joyously decorated Teddy Bear Suite literally comes to life with hundreds of teddy bears dressed for the holidays, spread throughout the multi-room suite, engaged in all sorts of adorable teddy bear activities. Visitors get to enjoy one of the largest Teddy Bear collections on the east coast. There are teddy bears having tea, spa bears in the bathtub and shower, teddy bears reading, teddy bear angels and ornaments, fireside bears, musical bears, car and bike riding bears, miniature bears, larger-than-life bears, and nowhere, are there more bears, than the giant teddy bear bed. 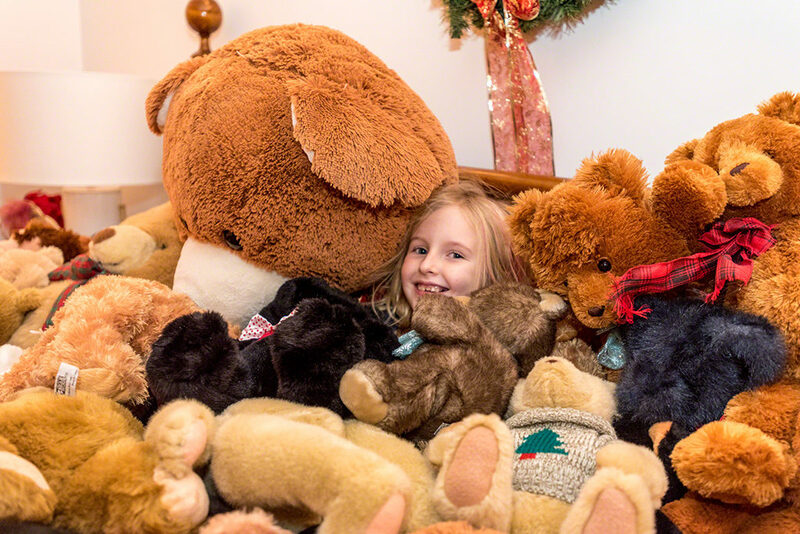 Thousands of people now visit the Teddy Bear Suite each year. Many families have made it their favorite holiday family photo op — where kids of all ages have big smiles on their faces, and a twinkle in their eyes. 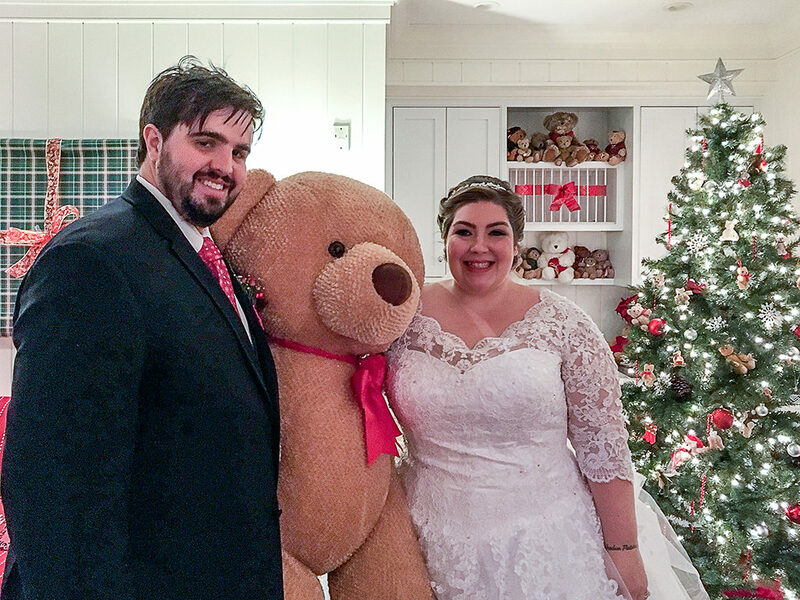 We’ve even had a bride and groom make a special Teddy Bear Suite wedding stop! 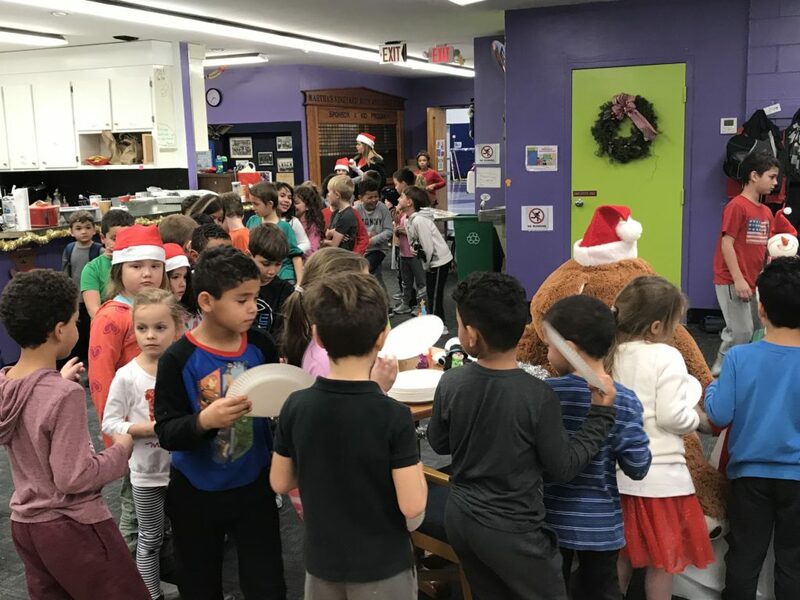 “We wanted to create a magical holiday tradition that was inclusive and fun for the entire Vineyard community — that helped bring out the child in all of us — while also helping raise much needed funding and support for our year-round island families through the Boys & Girls Club After School Program,” said Teddy Bear Suite Co-Founder, and Point B Realty Principal Broker/Owner, Wendy Harman. We have a few other fun traditions each year, in addition to opening the doors to the Martha’s Vineyard Teddy Bear Suite. 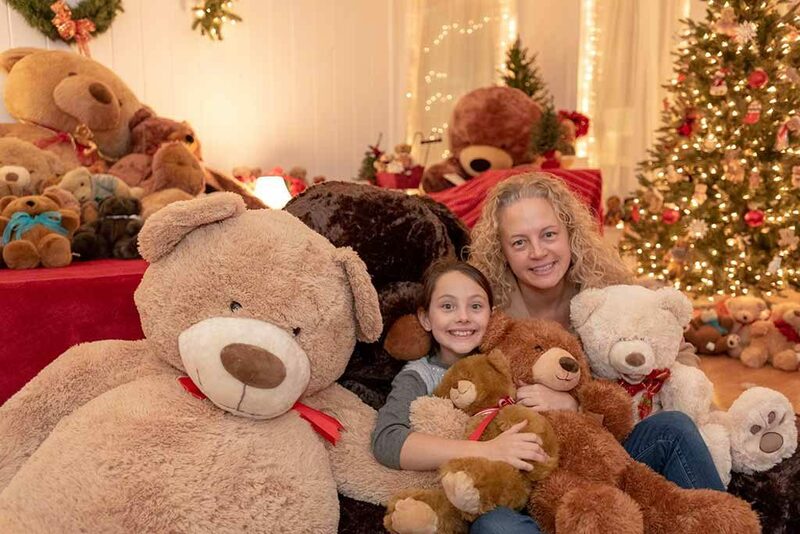 We add a new big bear — and we mean life-size — every year to the Teddy Bear Suite family. And we invite all our friends, supporters, donors, and followers to vote for a new name using social media — Facebook, Instagram, Twitter, and right here on the website. 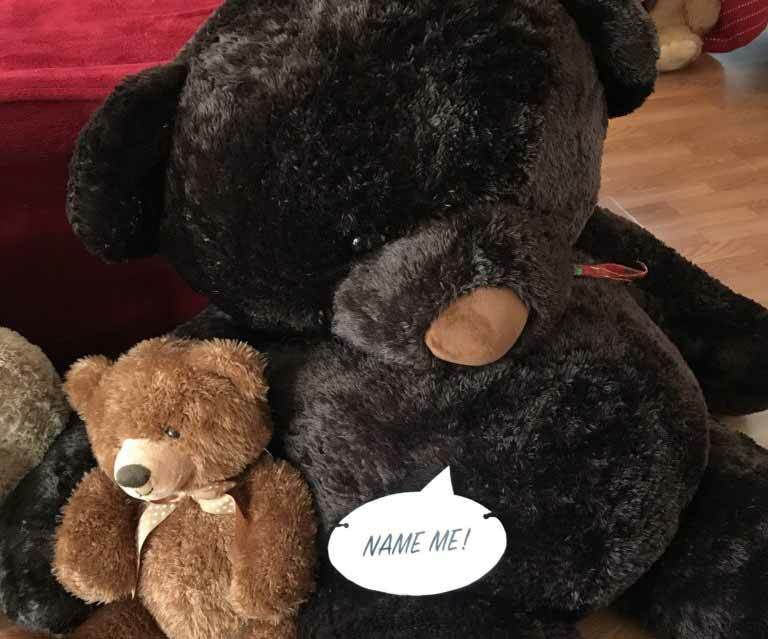 Our hashtag for all things Teddy Bear Suite related, including names, is #mvteddybearsuite. You can follow all the action on our Social Media Feed page. When all the votes were counted in 2018, our new female big bear’s name, by popular demand, was Tashmoo (as in Lake Tashmoo). Yes, you will notice a decided Martha’s Vineyard influence for all our big bear names. So, the Big Bear family includes: Edgar, Chappy, TisBeary, Obie, Lambert, Quinn, Nemsha, and now Tashmoo! Our big Teddy Bear mascots also join in the Christmas In Edgartown Parade. Look for us in our caravan of MINI Cooper convertibles, waving to the crowd, and throwing out gummy bear candy! 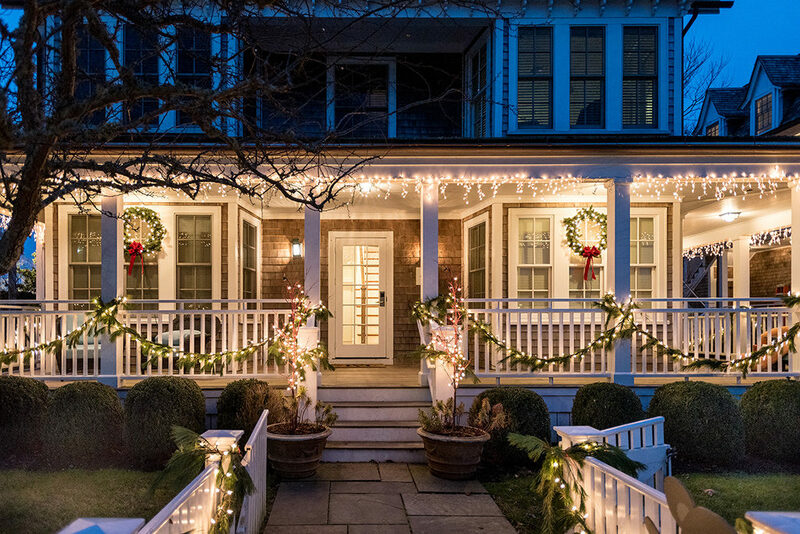 Then it’s back to the Teddy Bear Suite, for the always busy Christmas in Edgartown weekend. Speaking of which, the annual Teddy Bear Trot Holiday 5K Run and Walk has come into its own. This is now a timed and measured 5K for serious runners, organized by the Vineyard Hurricanes running club, and a lot of fun, for everyone else. All ages welcomed. It’s held Sunday morning, with the starting and finish line in Nevin Square, at the Teddy Bear Suite and the Point B Office. 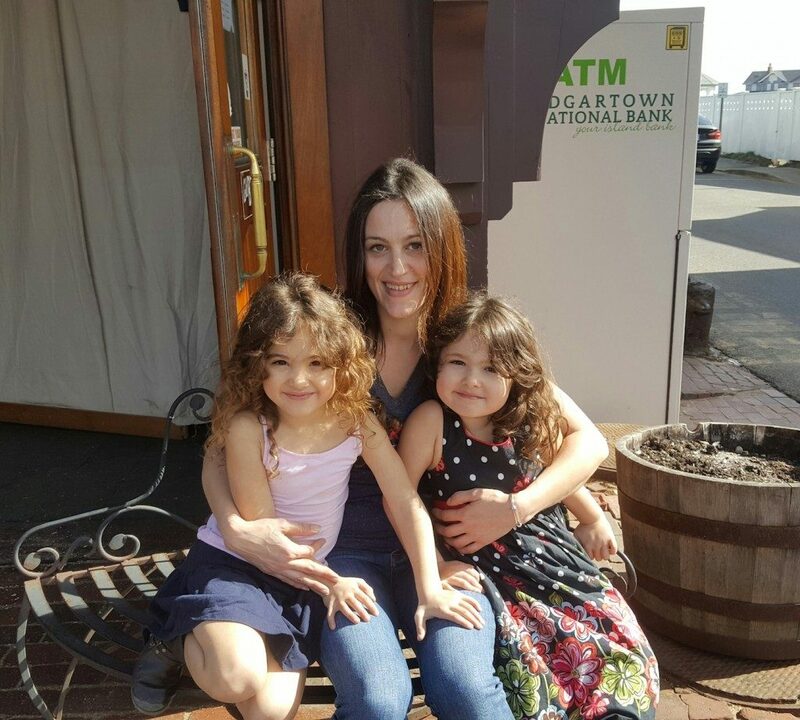 All money raised is donated to the Teddy Bear Suite Fundraiser. In 2018, the Teddy Trot raised more than $3,000!